Ammonia from farm animal waste and fertilizers plays a little-known role in producing health-harming air pollution. February 5, 2018 — Editor’s note: This story was produced in collaboration with the Food & Environment Reporting Network, a non-profit investigative news organization. In the United States alone, air pollution kills about 115,000 people a year — more than three times the number of deaths caused by motor vehicles. Worldwide, some 7 million people died in 2012 alone from exposure to air pollution, according to the World Health Organization. The U.S. and other developed nations have taken major steps in recent decades to decrease pollution emissions from smokestacks and tailpipes. Yet a surprising source of harmful air pollution particles — emissions of ammonia from livestock manure and synthetic fertilizer application — continues to grow in parts of the U.S., Asia and Europe. “When people think about air quality, they think about factories and power plants and transportation. But agriculture is a substantial contributor to reduced air quality, too,” says Jason Hill, associate professor of bioproducts and biosystems engineering at the University of Minnesota. Potential solutions — say Hill and other experts — will hinge on the efforts of industry, society and government regulators. Small air pollution particles can infiltrate deep into the lungs and even enter the bloodstream. In very old people and people with underlying illnesses such as asthma and heart disease, they can make heart and breathing problems worse and may even result in death. These tiny specks of particulate matter — about 1/30th the width of a human hair — are called PM2.5 and have many sources. Power plants, factories and cars can pump such particles — and the precursors to these particles — into the air. So, too, can natural events, such as forest fires. Sometimes PM2.5 forms when gaseous chemicals react in the atmosphere. Ammonia, a nitrogen-based compound, is one of those chemicals. In the past 70 years, global emissions of ammonia have more than doubled from 23 to 60 teragrams per year. (One teragram is 1 billion kilograms or 2.2 billion pounds.) Researchers say the increase is due in large part to an increase in ammonia emissions from agriculture. Our ability to grow crops depends on nitrogen, which is a critical plant nutrient. But in overabundance, nitrogen can spell trouble. Nitrogen in animal waste and in excess fertilizer can turn into gaseous ammonia. 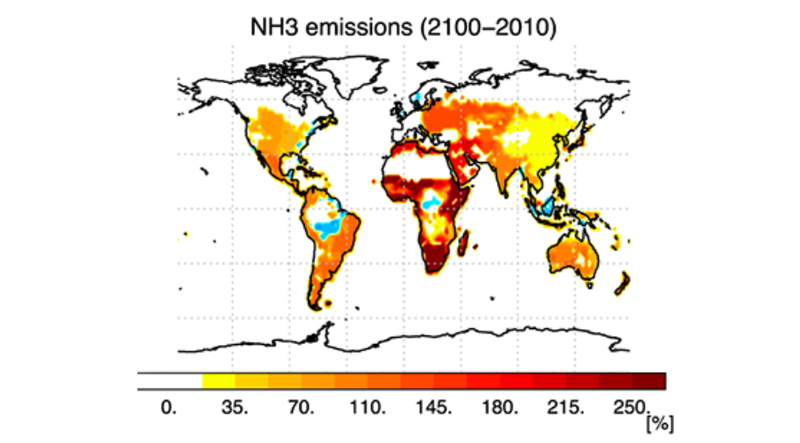 In fact, in the U.S. and Canada, agriculture accounts for more than three-fourths of all ammonia emissions. When ammonia enters the atmosphere, it combines with air pollutants — mainly nitrogen and sulfuric oxide compounds — from nearby vehicles, power plants and factories to form PM2.5, which can travel long distances in the atmosphere. That’s how ammonia emissions in one part of the country can impact air quality in a downwind region. A few years ago, a group of scientists led by Jos Lelieveld, a researcher at Max Planck Institute for Chemistry in Germany showed that agricultural emissions were the largest contributor to PM2.5 in Europe, Japan, Korea, Russia, Turkey and the eastern U.S. and the leading cause of deaths attributable to air pollution in Germany, Japan, Russia, Turkey and Ukraine. They estimated on a global scale that one-fifth of PM2.5-related deaths could be avoided by eliminating agricultural air emissions. “There’s a very tight link between growing food and ammonia-based small particles in the atmosphere,” says James Galloway, a biogeochemist at the University of Virginia who studies how nitrogen cycles through the environment. Technologies to tackle the ammonia emissions problem already exist, says Carolyn Opio, a livestock policy officer at the Food and Agriculture Organization of the United Nations in Rome. Researchers now are working on ways to apply them in ways that don’t harm our ability to produce food. Researchers estimate that livestock production contributes roughly two-thirds of ammonia emissions associated with agriculture while nitrogen fertilizer use contributes about one-third. One way to reduce ammonia emissions from livestock may be to reduce the amount of nitrogen getting into animal waste in the first place by lowering the protein content of animal feed, says Jeff Collett, an atmospheric scientist at Colorado State University. In a perfectly efficient system, every nitrogen atom would go into making more cow (or milk). In reality, a substantial amount is excreted as waste, and this excreted fraction increases as protein intake exceeds dietary requirements. “Up to 80 percent of nitrogen in feed is lost to the environment,” says Opio. More than 50 percent of the nitrogen content of manure comes in the form of ammonia, which can easily volatilize and enter the atmosphere. Michael Formica, a spokesperson for the National Pork Producers Council, says the hog industry has been tweaking the ratios of nitrogen-rich soybeans to carbohydrate-rich corn in pig diets for years. The goal is to cut costs, since protein is typically the most expensive part of feed. 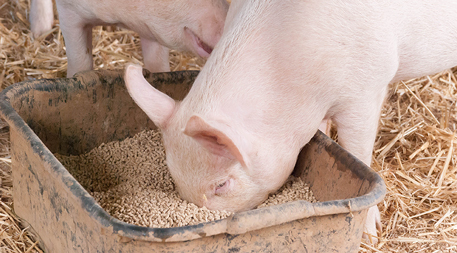 Diets are becoming more targeted, and as a consequence the nitrogen content of pig manure is now “a lot lower” than it used to be, says Formica. The nitrogen that remains in manure is useful for fertilizer. The trick is to keep it out of the air so it can enrich plants instead. They estimated that a 50 percent reduction in agricultural ammonia emissions worldwide could prevent more than 200,000 deaths per year across 59 countries.Better techniques for storing manure before it’s spread on fields could help, says Lelieveld. In 2017, Lelieveld and colleagues conducted a global cost-benefit analysis of different options for reducing ammonia emissions from agriculture. They estimated that a 50 percent reduction in agricultural ammonia emissions worldwide could prevent more than 200,000 deaths per year across 59 countries. Deep, capped pits — either underneath livestock housing or outside in below-ground, concrete-lined storage tanks — ensure that less manure comes in contact with the air than storage in open pits, piles or ponds. The researchers found that the widespread adoption of better manure storage in the European Union — using concrete, corrugated iron or polyester caps on manure pits — would have cut ammonia emissions in the EU alone by up to 80 percent. Meanwhile, a big problem with manure in low- and middle-income countries, according to Opio, is that farmers who have manure aren’t very well connected with the farmers who need it. “They lack the infrastructure to trade manure,” she says. As a result, farmers consume synthetic fertilizers while valuable manure goes to waste. So, developing countries should focus on building capacity and educating farmers on the economic co-benefits — what farmers stand to gain from picking up these practices, says Opio. When using manure as a fertilizer, some techniques result in lower ammonia emissions than others. 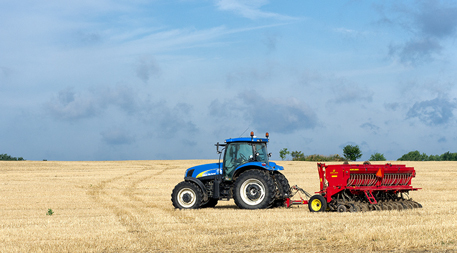 Techniques that deliver manure into the soil — injection or band application, for instance — typically produce fewer emissions than spreading or broadcasting manure over the soil surface. Applying manure at the right time can make a difference, too.Applying manure at the right time can make a difference, too. In Colorado, an early warning system alerts livestock producers to certain weather patterns that are more likely to carry ammonia emissions toward the Rockies. “Maybe you change your pen cleaning schedule around or you wait a day or two to move around or spread big piles of manure or you alter the timing of fertilizing a new crop,” says Collett. Such voluntary actions offer some potential to reduce harmful nitrogen deposition in Rocky Mountain National Park, he says. A similar system could be designed to protect public health by lowering emissions on days in which conditions are more favorable for the formation of harmful particles, says Collett. Although such warning-based systems can help reduce emissions impacts and are great for engaging stakeholder communities in discussing and considering voluntary solutions to challenges around nitrogen deposition, they are unlikely to meet the full need for mitigating emissions, he says. Slight tweaks in the type of synthetic nitrogen fertilizers used on fields could also cut ammonia emissions. Hill and colleagues showed that for switchgrass production, a simple change from one type of nitrogen fertilizer to another type that volatilizes less readily could reduce ammonia emissions and cut associated health costs by about half. Crop rotation that includes crops such as alfalfa and clover that capture nitrogen from the atmosphere can help farmers cut back on the amount of nitrogen-based fertilizers they use in the first place, says Matt Liebman, a professor of agronomy at Iowa State University. And a cropping system that incorporates reduced tillage and continuous crop cover throughout the year “does a better job keeping soil in place and preventing nutrients from moving where they don’t belong than monocultures that occupy the land three to four months of the year,” Liebman says. If we have the tools and technologies to incorporate ammonia emissions-reducing measures into farming, why aren’t we doing more to reduce these emissions now? The old adage “simple but not easy,” pretty much sums it up. In developing countries, infrastructure poses a major challenge. In the United States, loose regulation of ammonia emissions fail to incentivize action. Some livestock industry groups say there is no problem with ammonia emissions to fix. There are upfront barriers for farmers — including labor costs involved in changing current cropping or manure systems. Consumer willingness to pay more for food produced in an environmentally responsible manner also plays a role, says Lelieveld. The U.S. regulates PM2.5 and gaseous pollutants, including sulfur dioxide, nitrogen dioxide and ground-level ozone, under the Clean Air Act. As a result, levels of these pollutants have decreased over the past few decades. Yet gaseous ammonia, a precursor to PM2.5, hasn’t received as much attention from government regulators. That’s in part due to the way that ammonia is emitted, says Galloway. 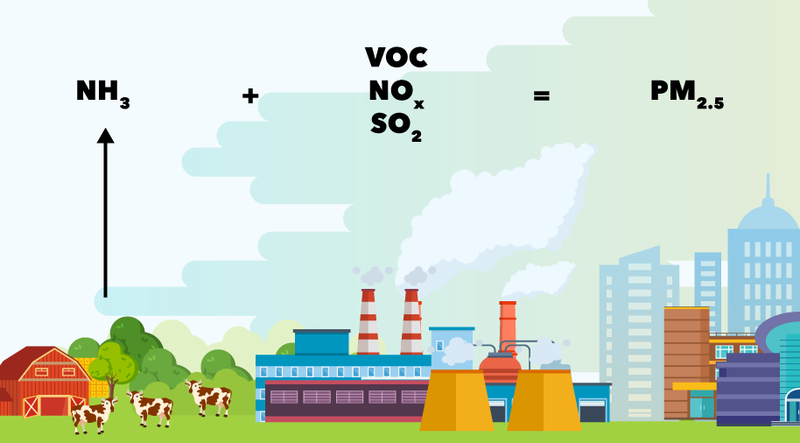 It’s relatively easy to regulate air pollution point sources by putting a catalytic converter on a car or a reduction device on a smokestack, but the sources of ammonia are heterogeneous and diffuse. “With ammonia there’s no direct way of regulating the emissions. You have to become more efficient in growing crops and managing manure,” Galloway says. In 2011, the Integrated Nitrogen Committee of the U.S. Environmental Protection Agency’s Science Advisory Board recommended that the EPA explore regulating ammonia emissions. Agriculture industry groups opposed the move. The EPA has yet to act on the recommendations, though the agency does consider ammonia emissions a precursor to PM2.5 and acknowledges that long-term ammonia air exposure can increase the risk of breathing and other lung problems. EPA scientists use the open-source Community Multi-scale Air Quality (CMAQ) model to model air pollution scenarios and answer questions that remain about the air pollution contribution of gaseous ammonia from agriculture. The model allows researchers to investigate how changes in ammonia emissions from different sectors can change particulate matter concentrations through time, says Jesse Bash a physical scientist in EPA’s National Exposure Research Laboratory. According to Bash, reducing ammonia emissions may do more to lower particulate matter concentrations in some regions than others. “Obtaining that information will help us develop a model that’s relevant for informing people on the policy side,” he says. Some countries in Europe, including the Netherlands and Denmark, have taken steps to reduce ammonia emissions from agriculture. Some countries in Europe, including the Netherlands and Denmark, have taken steps to reduce ammonia emissions from agriculture. The Netherlands Ammonia and Livestock Farming Order creates rules on new housing and better feed to reduce the amount of ammonia leaving farms. In 2012, the Economic Commission for Europe (a United Nations program created to encourage economic cooperation between member states) instituted limits and voluntary reduction targets for EU member states through the Gothenburg Protocol of the United Nations’ Convention on Long-range Transboundary Air Pollution. Ammonia emissions in the European Union decreased by 23 percent between 1990 and 2015. In 2015, several member states and the European Union as a whole exceeded ammonia limits set by the convention. Another regulatory approach could involve reducing availability of the other air pollutants that gaseous ammonia reacts with to form harmful particulates. “You need a certain amount of background pollution so that agricultural emissions can start to increase PM2.5,” says Susanne Bauer, an atmospheric scientist at Columbia University’s Center for Climate Systems Research and the NASA Goddard Institute for Space Studies. 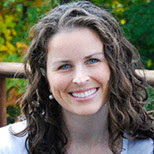 Bauer and her colleagues modeled future emissions scenarios and showed that further reducing vehicle and industrial emissions could lead to a decrease in health-harming aerosols, even if farm emissions continue to rise. Yet that doesn’t mean we should ignore the problem of ammonia emissions now, she says. Editor’s note: Jason Hill is a fellow of the Institute on the Environment, which publishes Ensia. Please stop posting pictures of pasture d animals when referring to the effects confined animal feeding operations, and stop calling them farms. They are industrial animal factories, not farms. When you continue to use the language and pictures of real farmers for these operations, you feed the industrial entities' propaganda and distort the message of your articles.